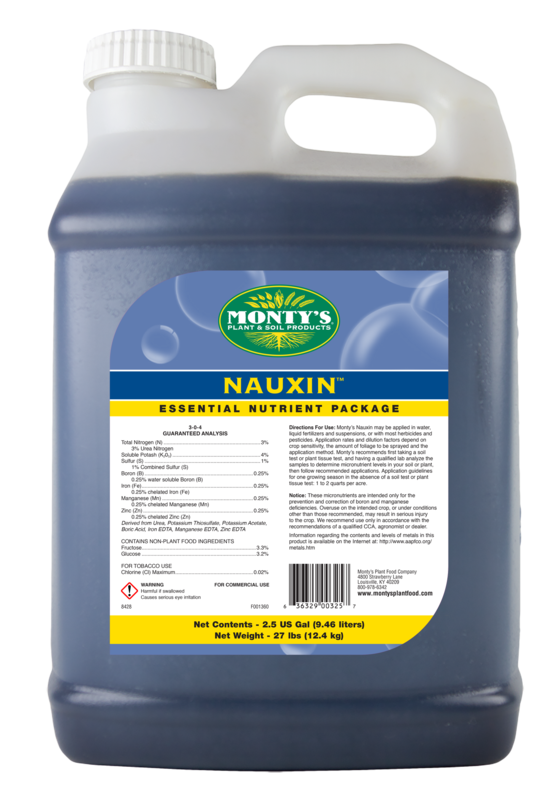 Monty’s Plant Food Company, a leader in natural soil enhancement and plant fertility products, is pleased to introduce Nauxin nutrient package. Nauxin is a unique blend of Monty’s technology designed to provide nutrients to the plant at any stage of growth, helping maximize the plant’s yield potential. It is specially formulated to apply nutrients to the plant during herbicide application, and is critical to helping the plant overcome stress. Nauxin’s has been formulated and approved to work with various herbicides including Engenia®, Enlist™, and XtendiMax®. Nauxin contains eight different nutrients, including Nitrogen to enhance growth and green-up, and a specific form of potash designed to help strengthen the cell wall. Nauxin’s active ingredients include Nitrogen (3%), Potash (4%), Sulfur (1%), Boron (0.25%), Iron (0.25%), Manganese (0.25%), Zinc (0.25%), and Sugar (6.5%). Nauxin should be applied 1 to 2 quarts per acre in a foliar spray, drip line, or through irrigation. It can be applied to any crop, and is tank-mix flexible. It can also be applied with insecticides and fungicides. For more information, click here or call 1-800-978-6342.